In August, I had the opportunity to travel down to Atlanta for a Nationals-Braves series. It was my first time at Turner Field since before I was two years old, and I took the opportunity to tour the stadium, looking for the absolute best seats. While this decision may be subjective, one thing is certain: food aficionados will love Turner Field and its many and various eateries. 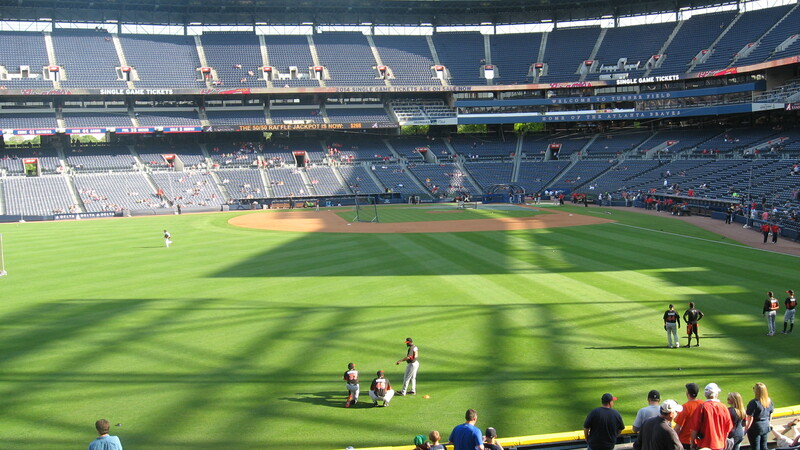 The Braves’ seating options are on the pricy end of baseball’s ticketing spectrum; however, fans still come from far and wide to see their beloved team. Luckily, StubHub offers baseball junkies more affordable opportunities than does the official MLB site, so I’ll be referring to prices I found there. 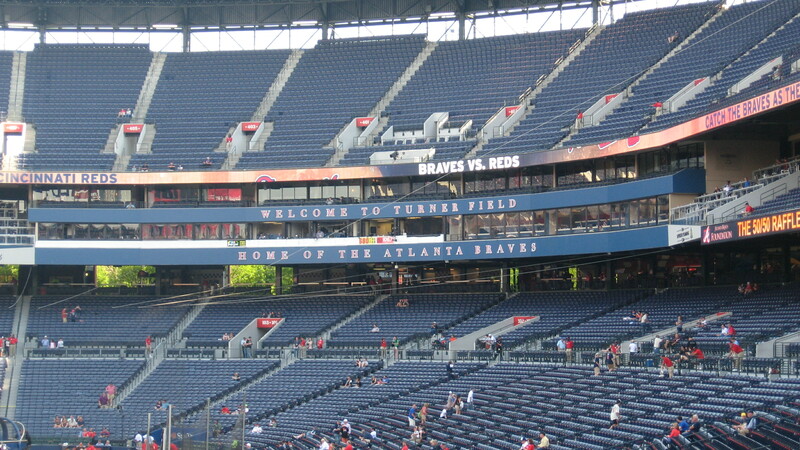 At Turner Field, all sections on the third base/left field side of the stadium are even-numbered, while those on the first base/right field side are odd-numbered. On StubHub, these seats run for a decent amount, upwards of $90-$100. If you find a deal, go for it and sit down by the field, but other places in the park will give you just as good of an experience for much cheaper. On the Field Level, the seating bowl is cut in half by a large cross-aisle. Consequently, the upper parts of each section–the 200 Level– do offer cheaper tickets. And of course, at a game with relatively low attendance, seat upgrading is always a possibility for anyone looking for a better view. These upper sections are numbered in the 200s, although they are on the same tier as the 100s. I sat in section 206 for the Marlins-Braves game I attended in April. The first batter hit a foul ball just a few feet from me, but that was the only chance I had all night. The 200s have their own concourse behind the seats, but can also be accessed from the 100-level concourse, which opens up to the cross-aisle. The away team’s bullpen is located in the left field corner between sections 128 and 132. Seats in the 200 level can run as low as $15 on StubHub if they are on the outfield end of things. Reasonably, the closer they get to home plate, the more expensive they run. For my game in April, I found a great deal and got $18 seats right up from home plate, but don’t expect to find that available for non-Marlins games. In the outfield, the largest seating section is in left and has the same numbering system as the baseline seats. A cross-aisle divides the upper (200s) from the lower (100s). Sections are long and straight, meaning that when it’s not crowded, the chances at catching home runs are not hindered by any physical obstacles. But since the seating area is so big, it’s all about location. The right center field seats and right field seats are also relatively large. 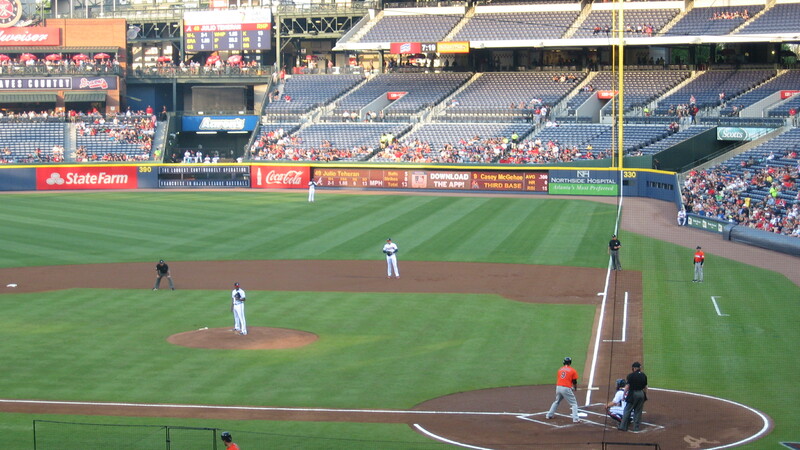 In fact, Turner field has as much lower-level outfield than any park in baseball. The bullpens run long-ways so they do not take up as much lateral room, and the batter’s eye is a modest size. The rest of the room in the outfield is taken up by seating. The cross-aisle from the infield sections runs all the way round to right field, and again separates the 100s from 200s. However, in both right and left field, the aisle is deep enough that it really provides no significant home run chasing advantage–it would take a really long home run for the aisle to be of any use. In the outfield, tickets run between $15 and $25. It’s an average deal for the view you get, and is certainly a good option for anyone not looking to spend a fortune. Turner Field boasts one of the largest club sections in baseball, consuming the 300 level all the way around the stadium (308-337). I have never sat in the club level, but I assume the views are fine as Turner Field is built fairly steeply, meaning even the uppermost sections are still right on top of the action. I witnessed a few foul balls land in the 300 level, but it still seemed like most ended up in the 200s. On the low end, these seats run for around $35, so anything under that is a deal. The 400 level wraps all the way around the field from the left field foul pole to above the right field seats. Sections 400-420, and 422, are actual ticketed sections, while 421 and 423-437 are general admission. 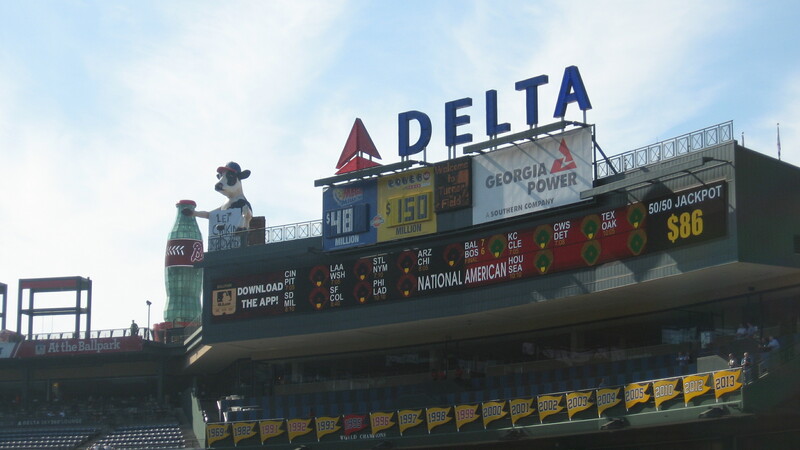 The skyline deck sits in left field and features giant Adirondack chairs, a 90-foot home-to-first basepath, and a great view of the Chick-fil-A cow as well as downtown Atlanta. Now, about that food I mentioned. The Center Field Plaza is hopping from the time the gates open until first pitch. It is a giant open space behind the batter’s eye that features restaurants serving eats from ballpark cuisine, to brick oven pizza and a barbecue house. There is also a large stage facing the main entrance that hosts pre-game entertainment. 400 level seats should be found easily for $10-15. The 100 field level concourse is packed full of concession stands. The new Waffle House sits right behind the left field corner, near the visitor’s bullpen. There are assorted hamburger grills mixed with stands serving typical ballpark food, and a few ice cream shops. On the 100 level, one can find Chick-fil-A in right field, behind 139, and down the left field line near section 112. There are also two Chick-fil-A’s on the 200 level and one in the club level. On the 200 level is a Bacardi alcohol outlet, but I wouldn’t know too much about that. There’s also a steak shop run by local chef Kevin Rathburn. I never entered the 300 level, but according to the Braves’ website there are some awesome food options including (presumably) Mexican places called La Taqueria and Fajita Action, and Smoke House BBQ, in addition to a full-service bar. Atlanta is known for its food, and they certainly take care of their baseball fans as well. When it comes to ballhawking at Turner Field, the cross-aisle provides great mobility from section to section. However, to go from left field to right field (and vice-versa), one must exit to the concourse and walk around the batter’s eye. I have had more success catching home runs in right field than left, but mostly because it’s much more crowded in the left field seats. For evening games, the sun sets on the third base side so make sure you bring sunglasses if you plan to track home runs in right field. 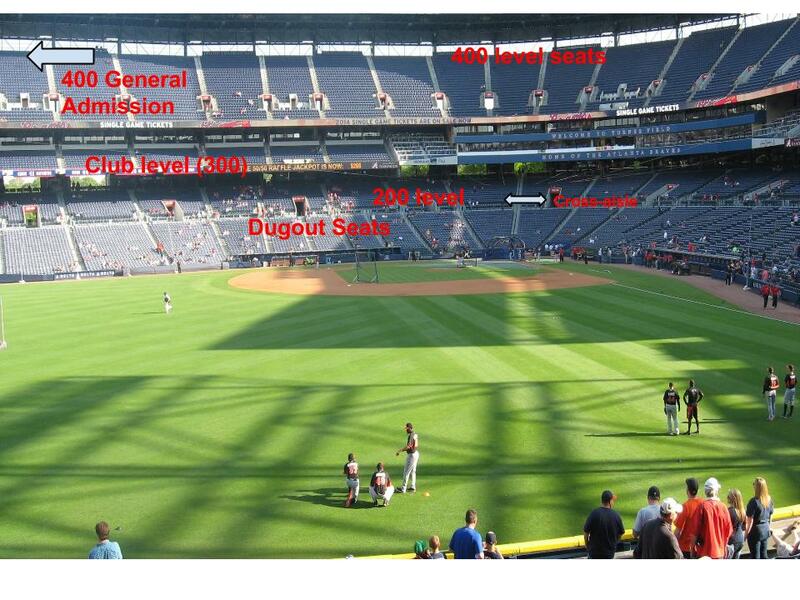 Turner Field has a massive gap between the wall and the outfield seats, and ball retrieval devices are welcome. If you have one, go for it! But exercise courtesy and give children the first crack at picking up baseballs. So where are the best seats at Turner Field? Personally, I love foul ball territory, so sections 205 and 207 are right up my alley. They sit on the right side of the field, right next to home plate in good alignment for foul balls of the bats of right handed batters. The press box is right above this realm of seats, taking up the room in the club level that would be premium foul ball sections. Instead, the balls that would land for those lucky fans end up bouncing off the facade of the press rooms and trickle down to fans on the field level. 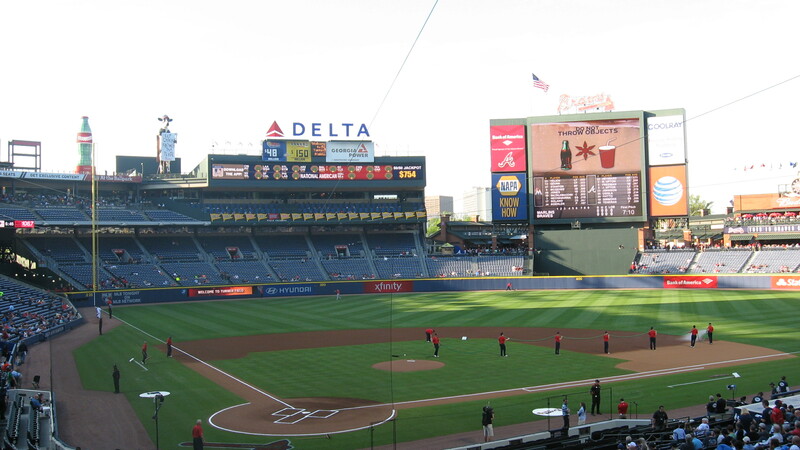 I like how Turner Field was designed simply. There aren’t too many different seating options, mainly just one large bowl that is organized orderly and easy for fans to assess. Beware of the Tomahawk Chop if you enter Atlanta as an out-of-town fan, but other than that Southern Hospitality thrives in this park.